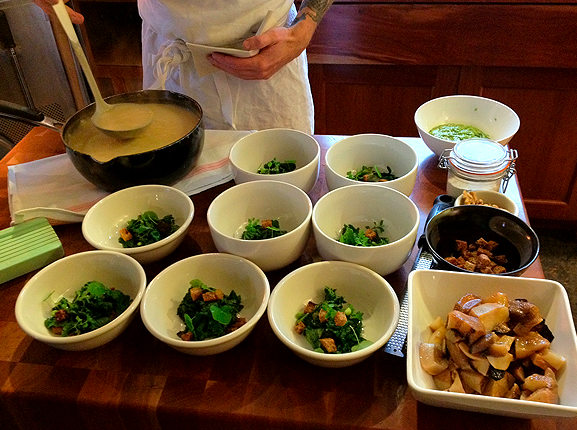 Fish, Forage, and Farm at The Willows Inn | Ooh, my favorite! Last fall Andrew was invited up to Lummi Island for a little getaway at The Willows Inn. I’ve written about my love affair with the island and the restaurant before, so I was desperate to find a way to cleverly blackmail work my way into the trip. The Fish, Forage, Farm event is a hands-on excurision driven by guest participation, with each of the activities and the menus all focusing back to the island, restaurant, staff, history. So two nights of great food, happy company, and quiet island life was sure to be nothing short of epic, even in the midst of a Pacific Northwest autumn. Of course I worked my way in and have been waiting forever to share the full experience with you. I wanted to wait until after they reopened (they’re on sabbatical for January and February), and since they open this Thursday I figure I’ve waited long enough. Our hosts for the two days were Chef Ben, and Nettles farm maven Jennifer. There were five others that joined in, and we were all welcomed in front of a cozy fire at The Inn. A beautiful set-up of freshly baked breads and pressed apple cider (spiked with Buffalo Trace bourbon!) were there to help us settle in as we made introductions and talked about ‘the agenda’ for the days ahead. And when I say agenda, let me just say that at one point Ben made sure to mention that if ever there came a point where one felt that they needed a nap…that they should do just that. (Some kind of agenda, no?) We also each received a sweet little welcome kit with a small notebook and pencil for notes, and a pair of Japanese herb scissors. 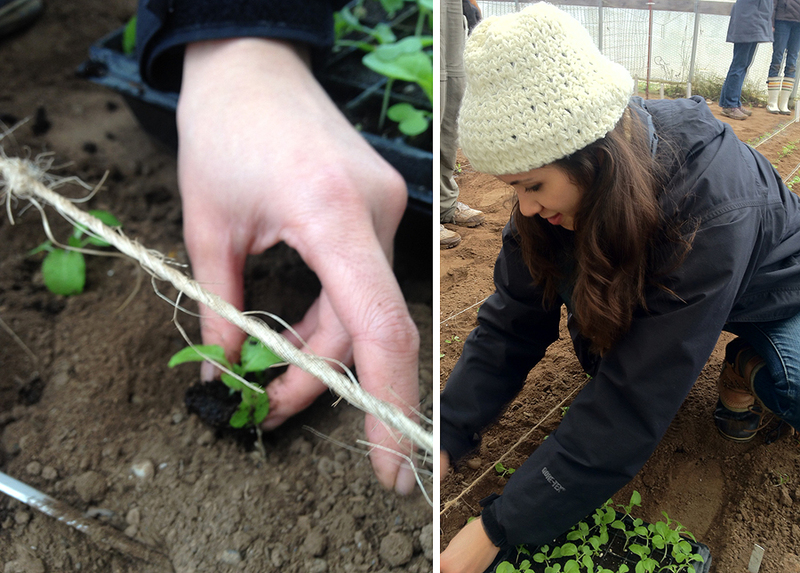 We soon made our way to Nettles Farm, just up the hill from The Inn, and Jennifer gave us a great little tour before putting us to work in the hoop house. And by work I mean she had the seven of us plant two rows of napa cabbage sprouts, harvest some kohlrabi for lunch the next day, and collect eggs. Yeah, it was rough. It was fun to know that in just a few short weeks those cabbage sprouts would grow to be used by Chef Blaine and his team, but my very favorite part of the time on the farm was spending time with Jennifer and hearing her fun stories about cultivating the farm, learning about the different varieties of each plant, and her overall enthusiasm for eating seasonally. 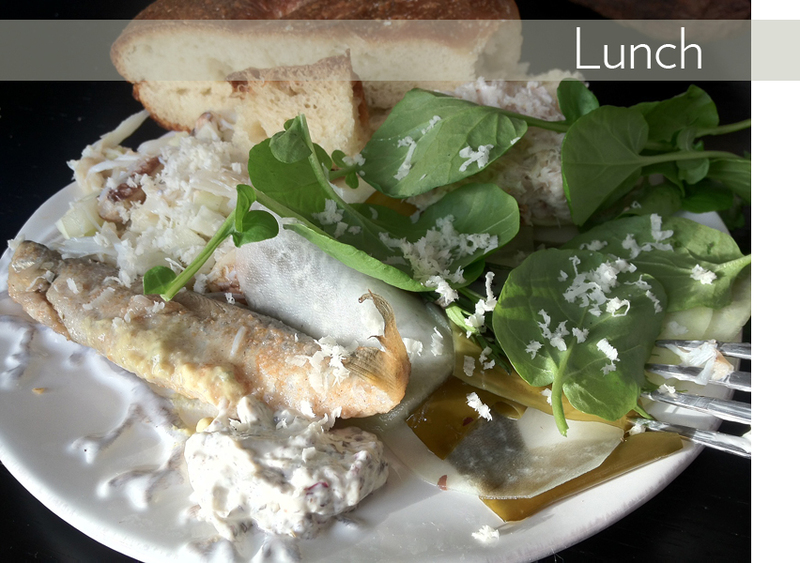 After “working” on the farm it was time to gather in the farmhouse for lunch, and since it was the first meal we’d enjoy with one another there was much to be learned and shared. Of course, the seemingly endless supply of white wine helped us all ease into conversation mode. But everyone was beyond lovely, and ultimately we were all there because good food, and being connected to it was in some way or another, important to all of us. The creamy potato soup, flat bread, and wine were all unbelievable. For nightly accommodations we were all split between two seaside guest houses, so each meal would switch between the houses. 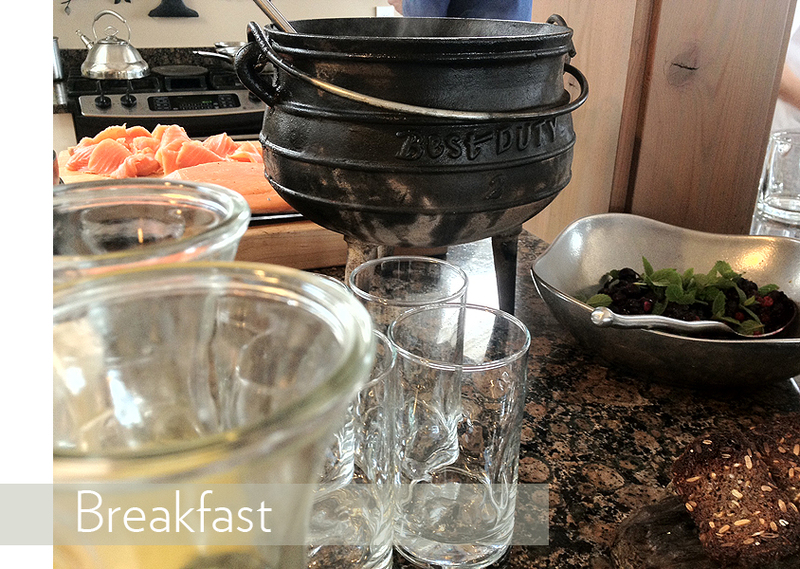 The first breakfast was at the house across the way and was a tasty mixed grain porridge, macerated berries, and gravlax from reef net caught salmon. How often does one get to wake to a perfectly made breakfast from an amazing chef? Not often enough. It was the perfect start before a relaxing autumn walk through the Otto Preserve, and a lesson on reef netting from Jerry. Jerry is a badass reef net expert that has lived and fished the waters around Lummi for years, and I just loved listening to his stories and looking through his old photos. Since my very first meal on Lummi I’ve been fascinated by reef netting which is a historical method that allows for a more humane and sustainable way to catch the salmon. It ultimately allows the fisherman to select the best catches and set free those that don’t meet culinary standards with minimal shock. The pontoons you see above are rolled out into the bay and each platform/tower has a fisherman with a corner of the net. They trap the salmon and pull uniformly to raise the catch. After a fun morning outside and a great chat with Jerry I love so much that Ben had some nap time free time for us, because after that it would be time for the most perfect lunch ever. Ben as a chef: his attention to detail, effortless skill, and passion for good food was infectious and exhilarating. Ben as a host: was more like a friend, generously sharing his knowledge, excellence, and love for the island with all of us. Ben is my favorite. We were also really lucky to have his friend Brandon visiting from Toronto. It was great fun to see two gifted chefs and friends working together and the result was in this meal — one of my all-time favorite dining experiences. 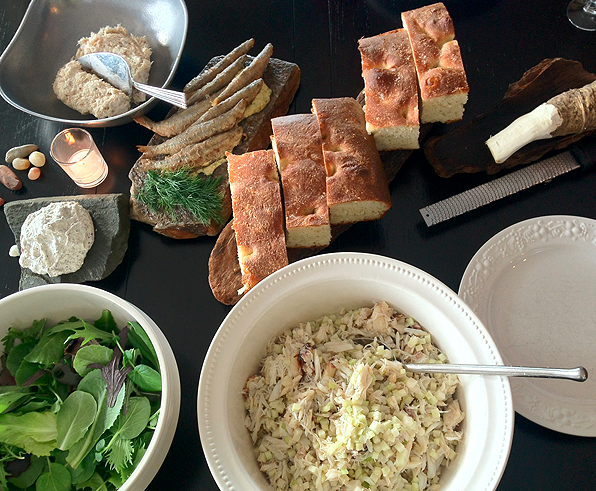 Crab salad (cleaned by two of our wonderful new friends in the group), fried smelt, freshly baked focaccia, horseradish creme, seaweed kohlrabi salad, and lots of bubbly. Our final nights dinner was another amazing feast of lamb, fresh oysters, charred cabbage, and pickeld shallots. There was also a guest appearance from our favorite bartender from The Willows, Emily, and she made her signature gin fizz with some of the eggs we’d harvested the day before! It was hard to prepare to leave the next morning, but we had a lovely farewell breakfast at The Willows and received a sweet farewell note and gift from Ben and Jennifer. 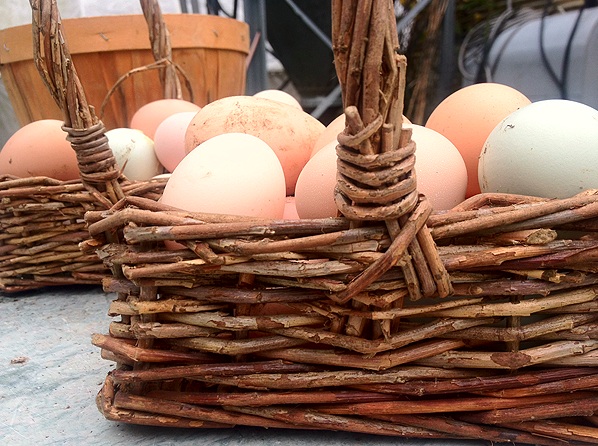 The eggs we’d harvested were ready for us in a sweet little basket. Those little and meaningful little touches add up to so much. 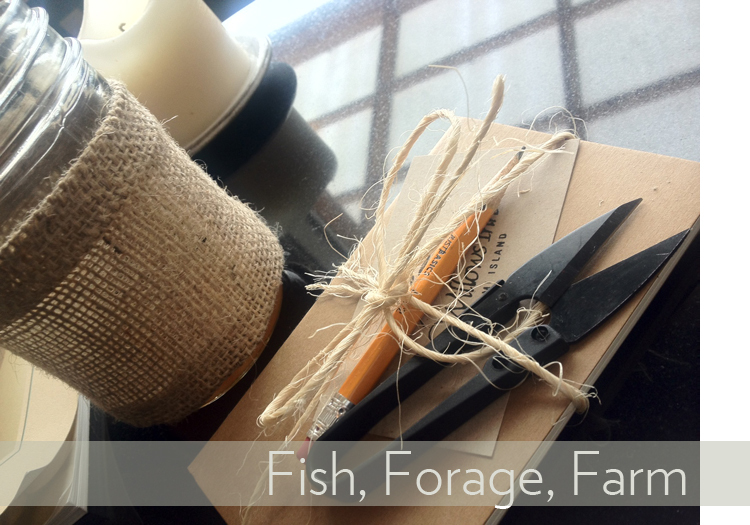 Just like a meal at The Willows Inn, the two-day escape for Fish, Forage, and Farm is the treat of a lifetime. The relaxing pace and soul-stirring meals with new friends was exceptional and memorable. And with genuine and wonderfully gifted hosts like Jennifer and Ben, the tone was set for a meaningful experience with a rare opportunity to connect with and understand the food that’s available at that time and place. It’s a powerful feeling. The spring season will be the perfect time to join in, and the “agendas” will differ with each session and season, so if you’re interested give them a call or check their site for upcoming dates. I would do it again in an instant, and would also like to wrangle some friends to come along too. What, no wine with breakfast? snicker. This sounds fantastic, what a great concept and beautiful surroundings. I have added this to my ever growing to-do list.